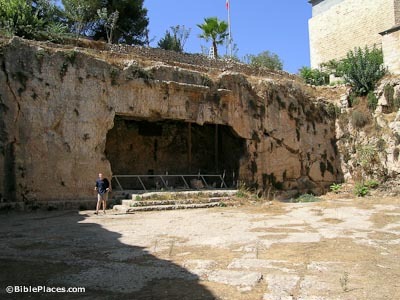 Generally regarded as the largest and most beautiful tomb in Jerusalem, the so-called “Tomb of the Kings” was the final resting place for the family of Queen Helene of Adiabene in the first century AD. 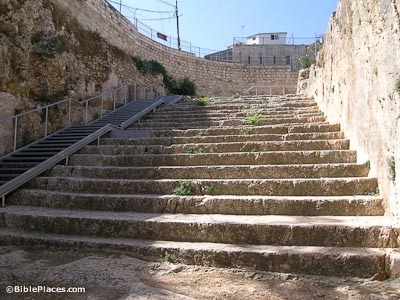 Located 820 meters north of the Old City walls, the tomb got its name from early explorers who believed that this magnificent tomb housed members of the dynasty of David. The tomb was described by the Greek geographer Pausanias as the second most beautiful tomb in the world (after the tomb of Mausolus, one of the seven wonders of the ancient world). This 9 meter wide staircase was originally paved and led to a forecourt with several ritual baths (only recently identified as such). Water collected in the baths from a channel system carved in the steps. The 90-foot (28-m) facade was crowned with three pyramids which no longer exist but are described by Josephus and other ancient sources. The architrave was originally supported by two pillars, fragments of which were found in the excavations. 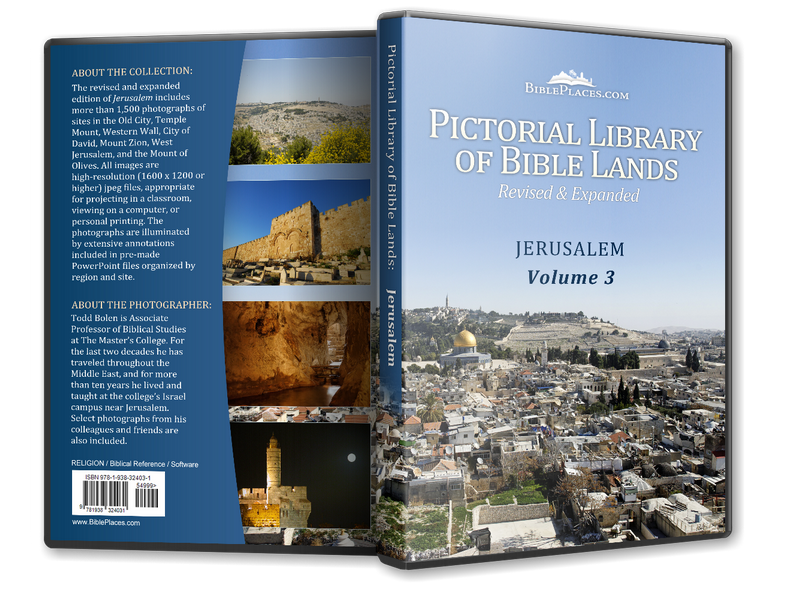 The definitive study of this site was done by Maximilan Kon in the first doctoral dissertation for the archaeological department of Hebrew University. 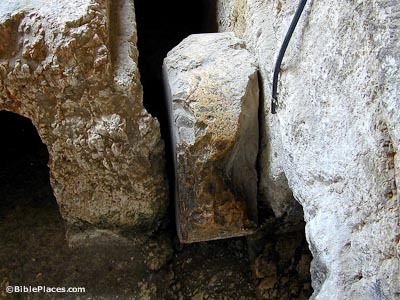 The entrance to the tomb was sealed with a large rolling stone. This stone was set in a deep channel in which it could be pushed back and held in place with a smaller stone. 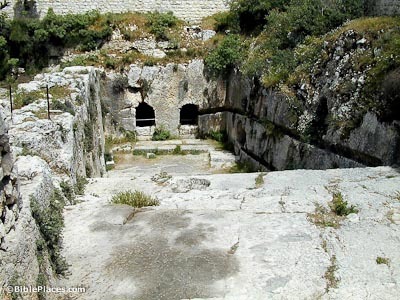 In the first century A.D., a “secret mechanism” (so NEAEH) operated by water pressure moved the stone. 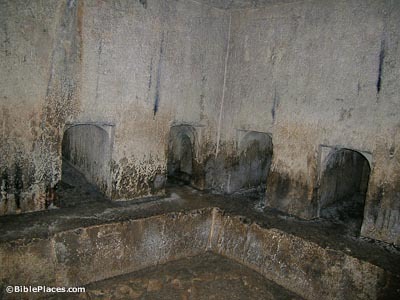 Probably a small amount of water pressure activated a system of weights to open the tomb. The two most common types of tombs in the first century AD. are both found in this tomb complex. 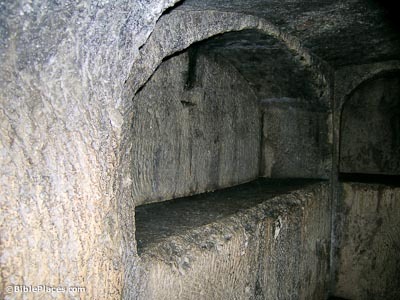 Loculi (kokhim) were long narrow shafts in which the deceased were placed and closed with a stone slab which probably had the name of the occupant inscribed on it. Channels in the center of the shafts were probably carved to drain the water that seeped through the rock. Download all of our Jerusalem photos! Antiquities of the Jews: Book 20, Chapter 2 (Bible Study Tools) Josephus’ record of Queen Helene’s conversion to Judaism. The Survey of Western Palestine (templemount.org) Excerpts from The Survey of Western Palestine, by Charles Warren and Claude Conder, including a section on this tomb. Entrance to the Tomb of the Kings (Petra Fine Art) An antique lithograph by David Roberts. Tomb of the Kings (Antique Maps and Prints) A steel engraving by William Henry Bartlett.